High quality solo literature for Beginning through Early Intermediate skill levels! Curnow Music Press, long known for publishing high quality literature for the young band, now focuses on the individual performer. With well over 100 distinct pieces of music in the 1st RECITAL SERIES, these are definitely NOT "one size fits all" books. All of the music has been arranged carefully for each specific solo instrument with Piano Accompaniment. Each 1st RECITAL SERIES book includes 12 solo pieces in diverse styles, from arrangements of "classics" to original compositions . This excellent literature is perfect for concerts, contests, recitals, churches, private studios, talent shows, school portfolios, and for home enjoyment. A beautifully re co rd e d Piano Accompaniment CD (included with the solo book) allows the soloist to practice and perform accompanied, even when a Piano player is not available. Of course, the Piano Accompaniment part can be purchased for live performance in concert or festival settings. 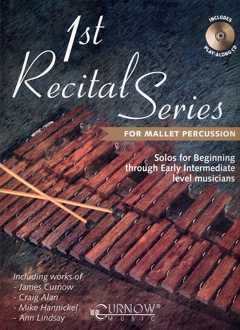 Also, a demonstration version of each solo with accompaniment is included on the CD, allowing the performer to hear a good demonstration of pro per to n e, expression, and performance techniques - an invaluable tool for learning.